It’s our goal to always improve Revaluate’s quality and ease of use. Today we are proud to announce a real estate industry first breakthrough in both areas. It’s the Revaluate Chrome Extension. Using Revaluate’s powerful predictive analytics, the Revaluate Chrome Extension can help top real estate agents like you find more people that are likely to move, and it will increase your insight into what prospects are engaged in your content. 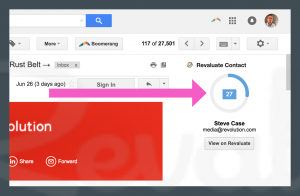 The new chrome extension automatically tracks when and what prospects open your emails. This open data is shown in the prospects profile. In addition, Revaluate automatically uses this open rate data to refine the scores of your prospects – further refining accuracy. Secondly, while you are communicating with the prospect in gmail, the Revaluate Chrome Extension provides you a new “heads up” style display – showing you the prospects score, giving you easy access to their profile and more insight on how to correspond. The best news, is that this upgrade is free for a limited time for current subscribers. To get your Revaluate Chrome Extension with tracking and heads up display started, download your extension here. If you’d like to learn more about Revaluate – schedule a time to chat with our team. The improved quality and the heads up style display are designed with you in mind. Let us know what features you’d like to see next and we will keep on innovating. What the heck is a Chrome Extension? Will it work on other browsers like Safari or Internet Explorer? This is a 4 min or fewer project for typical Revaluate clients. Are there Directions on how to set this up? 4 step, 4 min directions are right here.